We are going to do a lot things to release your shoulders today in our class. If you would like a super quick actionable checklist of 3 ways to release your shoulders, I will be sharing at the end how to get that. We reach the end of our Focused Living Series with the niyama, personal observance, Iswara Prandihaha, wholehearted dedication as translated by Nischala Joy Devi. Nicola Bachman translates Isvara as personal God and Prandihaha as an act of humility. He unpacks Iswara Pranidhana then as a deep faith in our inner knowledge which leads us towards enlightenment. Over the last ten weeks we have been bringing awareness to the violence that the lack of focus is causing in our lives, discovering if we are investing our time in what is personally important to us, noticing where we overextend our energy by moderating it, letting go of parts of our identities, relationships, opportunities and activities, allowing ourselves to be transformed through the descending journey, creating simplicity through continual refinement, nourishing our depths through inner contentment, creating boundaries in our lives, and inner knowledge through self reflection rather than information overload. 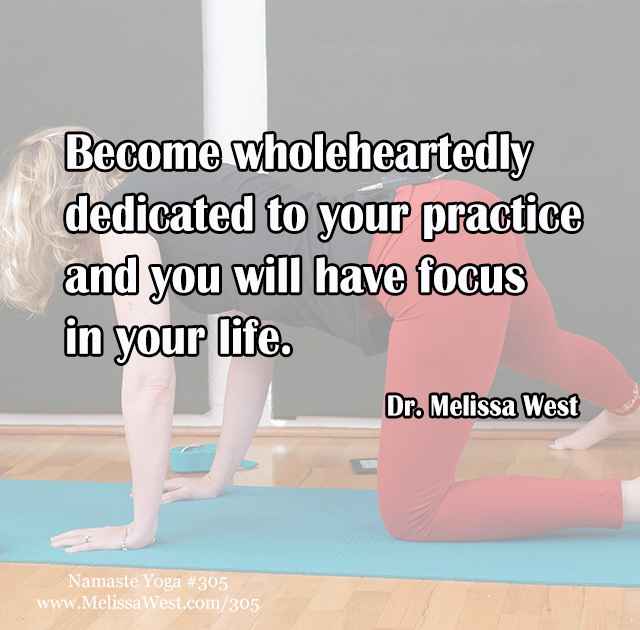 All of these practices and yoga lessons have been creating a container for focus, or as Nischala Joy Devi says, wholehearted dedication. Where is your focus? Where to you dedicate your attention? Is your attention pulled in a million directions? There are so many things vying for our attention. Our children, our parents, our partners, our employers, the many people we are responsible to in our lives. The fact that we live in a consumerist culture means there are a lot of companies trying to get our attention to spend our money with them by playing on our fears and insecurities, our wants and desires. Then there is the whole other level of social media which can be a huge resource of education, but also a wormhole of distraction. If we don’t come to social media with mindfulness and ironclad focus and crystal clear intention then we will find ourselves losing focus and hours of our precious time. It is through the container of our spiritual practice — yoga and meditation — that we can cut through all the noise. We can connect with a deep respect and our faith in our inner knowledge. Our trust in our True Nature and basic goodness is built every day through our spiritual practice by taking time out from the noise and busy-ness of our everyday life. 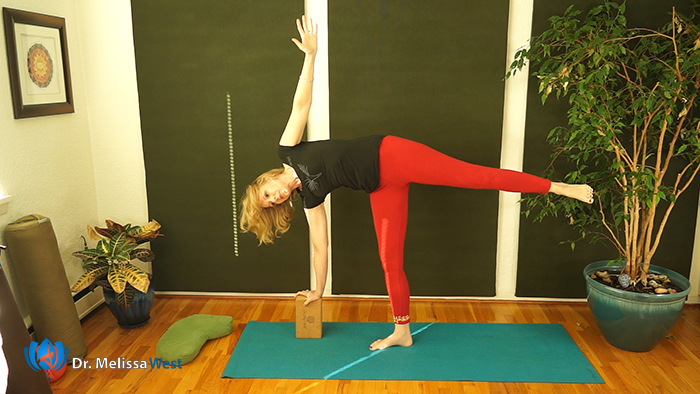 By creating the space through the container of our spiritual practices we can then take it off our mat and do it in practical ways throughout the day. Taking this whole hearted dedication to whatever task at hand allows us to bring presence throughout our day. When you go to your cell phone take a moment to take a breath and ask yourself, what is my intention here? What is my focus? If it is to check the weather, then check the weather. Notice if you start to go and do something else one you are in there. Ask yourself, what needs are being filled by doing this something else when it was not my original intention. If you are tired and need energy, perhaps your need for rest could be fulfilled in another way. Thank you so much for your donations. Thank you to Viola, Bene, Ivy, and Hannah for your donations. Question for the comments: What is one thing that you are going to give wholehearted dedication to this week? We did a lot of things to release your shoulders today in our class. If you would like a super quick actionable checklist of 3 ways to release your shoulders, then click below. If you would like more support to release your shoulders and hips then we have our members favourites in our membership community, hippy shorts and shoulder shorts. Both series are 10 classes long filled with 10-30 minutes classes for when you are short on time to release your shoulders and hips. Previous post: Do you have neck pain? Next post: What is stress? What can you do about it?